Whenever I work out mid day, I usually run errands afterwards. I like eating snack bars, protein bars and protein shakes after a sweat session. While these are convenient and quick, it can be costly if you eat them all the time. I try making homemade alternatives when I have time. For me, these scones are a healthy alternative for when you are on the go, need a quick breakfast or snack to tide you over before you can sit down for a meal. Makes 11 small scones. You can double the recipe if you want. Heat oven to 350 degrees. Combine all ingredients, add the egg whites and yogurt last. Stir until well blended. Coat large baking sheets with cooking spray or use parchment paper. Place spoonful of batter on baking sheet. Bake until peaks begin to brown, approx 15 minutes. Cool and serve. Make sure to keep the leftovers in a tight sealed container or it will dry out the scones. This is just the basic recipe, you can play around with the ingredients. If you want a scuffin (mix between scone and muffins) then you’ll need to add more of the yogurt, pumpkin puree or applesauce. You can add different toppings such as chocolate chips, dried blueberries or raisins. I’ve tried dried cranberries and pineapple in a few scones and the combination is delicious. I also like raisins and dark chocolate combo. 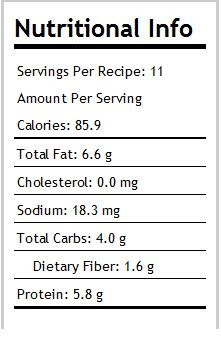 Nutritional info without any dried fruits. This will vary depending on the protein powder you use. I used vanilla rice protein powder, whey protein powder would work too. Dried cranberries and dried pineapple combo. Dried cranberries and dark chocolate combo. Great recipe and stats! I might give these a whirl sometime! Thanks, Pls report back once you’ve made it and also share the combo of dried fruits you used. I’m always curious about different combos and flavors. Your scones look wonderful — I love dried fruit in baked goods — the chewiness it adds is so delicious! The sweetness of the pineapple and the tartiness of the cranberry was a good combo. I might use it for a cookie soon. NICE! I love the nutritional profile 🙂 And of course they look delish! Yummy looking scones! I think I need to bookmark this recipe. Let me know once you’ve tried it and share the combo of toppings you used. Neat idea. I have protein powder to use up and I’m not a fan of just drinking it so I think I will be trying this recipe soon! Ps I love that you post the nutritional value. Awesome job. Thanks. Make sure to use a protein powder that you LIKE. The taste makes a big difference. If you don’t like the taste of the protein powder that you use, unfortunately you might not like the taste of these protein scones. these look delicious! i love packing homemade snack-type things, too. i love how these are different than your typical bar but have the same (i am assuming, at least) filling and nutritional effect. yum! Thanks for stopping by my blog. It is filling for me, my body likes protein and stays full if I incorporate protein in my diet. Make sure to use a protein powder that you like, it makes a big difference. those sound delicious and easy! thanks for the recipe. These look delicious and chock full of protein, which I am always lacking. You are one creative baker!! Mine are in the oven now and I only just read these responses. I’m not sure if I like my protein powder… I have only ever put it in yogurt smoothies and such. It seems alright… Do you have a brand that you love? I’d like to try it out if you do. The toppings I used (and I’ll post again to say how they tasted) are dried cranberries, chocolate chips (I got the “grain-sweetened” kind), and blanched slivered almonds. I am thrilled to have found your site. I’m going to try several of your recipes. I wanted to start with scones because I love scones in general. I have a passion for high protein stuff too. I used to do the zone diet and that really turned me onto it. I love baked goods too, so your site is really perfect for me. Thank you! Yep! Delicious! I love ’em! I didn’t think that protein powder would bother me! I actually don’t even taste it really. What makes this scone for me, I think, is the almond flour… YUM! I didn’t even know almond flour existed. The stevia is a little too strong though… perhaps I put in too much by mistake. I am going to minimize that next time. THANK YOU! I now have my key to delicious, protein scones! Hooray! I’m glad you tried this recipe and it worked out for you. I completely agree about the almond flour, I love using it for baked goods too. I actually prefer it over regular flour, but I have a hard time converting regular recipes and subbing the almond flour, I’m still playing around with ratios and such. Baking with regular flour and baking with almond flour is a completely different game. The protein powder that I am currently using is the EAS brand, Jay Robb brand and Soy Protein from Trader Joe’s. I like the way they taste and I use it to increase protein intake. Balancing protein with carbs helps keep me full and thus I don’t reach for junk food mid meals. I am on my third batch of these yummy scones. I didn’t realize the almond flour is so expensive! I was doing a lot of shopping the first day I was making them. It turns out the flour is close to $15 for just a 16 oz Bob’s Red Mill package at Whole Foods. That makes sense considering how expensive almonds are in general, but I am wondering if you have found it anywhere else for cheaper. Or is there a substitution? I am about to have a career change and certainly won’t be able to afford $15 for a 1 lb. bag of flour. I posted last time that the stevia was a little strong in my first batch. I realize that I probably didn’t stir my first batch well enough to spread the powdered stevia all around because some of the scones were INTENSELY sweet while others were only mildly sweet. The second batch I made I tried without any sweetener. It was pretty successful with the cranberries and choco chips in there to sweeten it up. But I am trying it with the sweetener once again and made sure to really STIR. The almond flour that I have been using the last year is from Honeyville ( http://store.honeyvillegrain.com/blanchedalmondflour5lb.aspx). I subscribed to their newsletter and every month (usually the 1st week) they run 10% off promotion on purchases. I’m currently on my 2nd 5lb bag and I love this product. It’s about $6/lb of almond flour, which is way cheaper than if you purchase them at Wholefoods. Trader Joe’s also sells almond flour, but I have not used it before and just looking at the bag, it’s not the same texture as the Honeyville brand. I hope this helps and let me know what you end up buying or if you find a better discount. Almond flour is definitely a staple in my pantry. My fiance loves the Eggplant Parmesan dish and I used almond flour in that recipe. Glad you are still enjoying the scones and thanks for giving me ideas on the different add-ins. I tried the scones with chocolate whey powder and banana instead of applesauce. I really wanted to like the recipe but the scones turned out pretty dense and chalky. I want tasty scones if I’m going to use expensive ingredients but they turned out disappointing. I’ll stick to protein powder only in my smoothies. Maybe it would have turned out better with different brand of protein powder?